Several scholars have written about how they plan their own publications, and I was a bit wary of writing a piece that would address how I plan my own publications stream and trajectory. Professor Erin Marie Furtak wrote on the Chronicle of Higher Education about how she has 11 types of pieces (categories) that she includes in her publications’ planner. The website Jobs.Ac.Uk also published a nice Research Publications Planner (free PDF) that can be also very useful. Finally, I also strongly recommend Professor Matthew Lebo’s “Managing Your Research Pipeline” piece in PS: Political Science. In my case, my Publications Planner is quite simple, and I divide it in two different sections: Conference-to-Journal Article, and Direct Paper. The conference-to-journal-article section basically outlines which journal I’m submitting the paper to, and what I am supposed to do to finish it. The direct paper section focuses on manuscripts I’ve decided to write and submit without going through a conference submission. One thing I do is update my Publications Planner through time (every week/two weeks) so that I know exactly where I am with each manuscript. But I recognize that maybe this method may not be optimal. The one thing I really ought to do is go through the list of manuscripts (these two tables are just a draft), and make sure EVERY SINGLE MANUSCRIPT I have in the works is included in these tables. 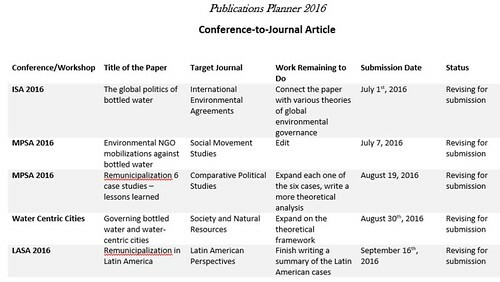 Tagged with AcWri, papers, publication, publication planner.